Dr. Aram Elovic has been providing dental care for the past 28 years. 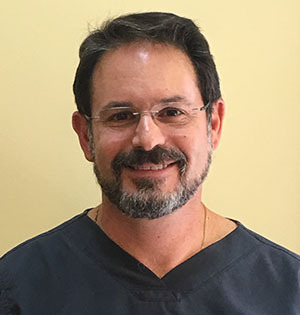 He is committed to providing his patients with optimal dental care and is dedicated to always keeping abreast with the latest in the dental field, so his patients can benefit from the best treatments available. Dr. Elovic makes anxious patients very comfortable with his gentle touch and with the aid of medications including nitrous oxide (laughing gas) when needed. He enjoys working with people and views his relationships with his patients with a deep sense of responsibility. Dr. Elovic values the importance of patient education and will always spend the needed time to explain your treatment and answer any question you may have. His goal is to treat his patients with the highest degree of skill with emphasis on patient comfort and safety. Dr. Elovic attended Case Western Reserve University for his undergraduate education, earning a BA in chemistry with a minor in art history. He then trained at the Harvard School of Dental Medicine. After graduating dental school he pursued a doctorate degree in oral biology with a specialty in oral pathology. He received a Physician Scientist Award from the National Institute of Health and conducted research on oral cancer. Dr. Elovic received the James H. Shaw Award for excellence in biomedical research from the Harvard School of Dental Medicine and the Milton Fund Award from the Harvard Medical School. Dr. Elovic provides a full range of dental treatments including crowns that enable the restoration of dentition and beautify discolored or crooked teeth, as well as implants, bridges, and dentures to replace missing teeth. His emphasis includes preventive dentistry with the goal of detecting problems early and using treatments to correct and reverse processes that lead to dental decay, loss of tooth structure, and gum disease. He enjoys restoring smiles using veneers and metal-free crowns, as well as using tooth-colored fillings, which are mercury-free and match the natural color of the teeth.